China makers have fundamentally changed the market for things such as LCD panels and 3D printers by producing in great volume at relatively little costs. Smartphone suppliers in the country, on the other hand, have had a more varied impact. China is more traditionally associated with inexpensive smartphones that do not come close to what Apple and Samsung offer. Today, however, China companies dominate the market thanks to quality products from the likes of Huawei and Xiaomi. Samsung and Apple are the last two non-China brands among the top five smartphone vendors, taking spots one and two, respectively. Now, even that could change. A survey from Nikkei covering forecasts from brokerage and research firms shows that Apple and Samsung could be facing sales declines this year. Nikkei estimates that iPhone shipments could fall from 230 million in 2015 to 200 million this year. Samsung could also see a drop from its 2015 shipments of 320 million units. With these downward trajectory, the combined market share of the two famed brands could drop from 47 to 34 percent. Apple has already posted its first sales decline in the history of the iPhone. A decrease in sales for 2016 could further hurt the company. Samsung appears even more susceptible to increased China competition, as Nikkei Asian Review points out, given that it relies on sales at the low and high end of the market. 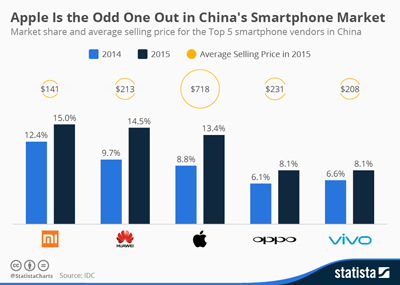 Smartphone makers in China have done well by producing quality units at low prices. Samsung, however, has remained the largest handset maker primarily by covering all the bases. Apple has done phenomenally well as a premium smartphone brand, but consumers have started to realize they can get mobile phones that are nearly as nice for half the price of an iPhone. Shipment declines are not limited to these top two companies. Other makers such as Sony and LG Electronics face the same fate. This is because most smartphone growth is now coming from developing countries, wherelow-priced models do best.